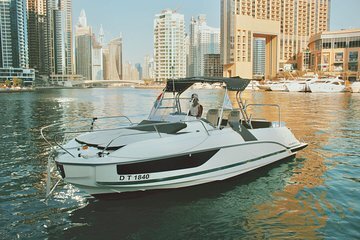 Take a private cruise around Dubai in a mini-yacht and take in the sights. Admire the Dubai skyline and see landmarks such as Palm Jumeirah, Atlantis the Palm Hotel, and Burj Al Arab. Stop for a dip in the warm waters and listen to your favorite songs on board with a provided stereo system. This mini-yacht is suitable for up to six passengers and is inclusive of light refreshments.